In a festive gift for opera fans, BBC Four will broadcast The Royal Opera's new production of Puccini's La bohème on Christmas Day at 7pm. It will be available to watch on BBC iPlayer for 30 days following broadcast. One of the best-known of all operas, La bohème is a romantic depiction of 19th century Paris, with a captivating love story and sweeping music. Filmed earlier this Season, Richard Jones's production stars Michael Fabiano, Nicole Car and Mariusz Kwiecień. It is conducted by Antonio Pappano. Also included in the Christmas TV schedule is another chance to catch 'Dancing the Nutcracker: Inside the Royal Ballet’, the BBC's access-all-areas documentary following the process of staging The Royal Ballet's The Nutcracker, which will be televised 31 December on BBC Four at 7pm. First broadcast last year, the 90-minute documentary focuses on debuts across the Company, from recently-promoted Principal dancer Francesca Hayward to young students from the Royal Ballet School. 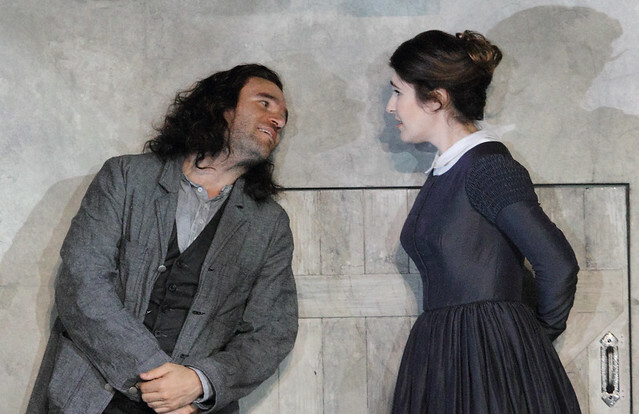 I was fortunate to see this production of La Boheme at ROH in September, and I loved it. I can't wait to see it again. What a wonderful Christmas gift - thank you! I wonder if it will be available on DVD too? The LA Boheme was not the greatest in any department. My absolute favourite opera. Can't wait! I agree with David Ellis. A new production of a much loved predecessor needs to be at the top of its game. This was truly awful. Michael Fabiano looked like an ageing Davy Crockett; and how four impoverished bohemians managed to live in that garret - 6' x 6' - beggars belief. What a shame. If I were Queen I would nip back to 1994 and rescreen La Traviata. What a happy Christmas Day that would be. Totally agree. I went and saw this production and was disappointed. I love this opera and was so looking forward to it. Wasted my money. Hooray - an alternative to ‘Strictly come Baking, celebrity grand designs, has-beens on train journeys having a jolly patronizing the locals etc.etc.’ Bravi! Will you live stream it? Thanks for your comment. The production was relayed live to cinemas earlier this Season. I saw the production at the ROH in September and again at the cinema showing - and thoroughly enjoyed the production and the musical performance, so another opportunity of seeing it is something to look forward to. I also hope that sometime in 2018, there'll be a DVD of this performance! That's wonderful news! At last an opera at Christmas. And what a good choice - we saw this production at the cinema (a sellout) and the entire audience were in tears at the end. Thank you so much! I can't wait to see it as i was sadly unable to attend a live performance in september. meanwhile The Nutcracker documentary is utterly brilliant and i look forward to seeing it again! I was lucky enough to get a ticket for this new seasons production having seen the old version more than 8 times...!! My only criticism if I had to make one was where I was sitting (back if thecstalks) at times the orchestra seemed to overpower the singing....!!! Please could you live stream both the Nutcracker and La Boheme again. In both instances, my local Everyman cinema was booked solid before I had time to book. I would really be happy to see them both. I wasn't lucky enough to get to see the new production this season, so this is an excellent Christmas present from the Royal Opera House on Christmas day! I look forward to tuning in. will you be streaming them on your you tube channel for those of us who don't have a tv? I'm afraid the broadcast is on the BBC and we don't have control of where it is shown in this case - however, you will be able to watch online or on demand on a laptop or iPad if you are a UK resident with a TV licence. Really excited to see this again, I saw the live screening and absolutely adored it, one of the best opera's I've ever seen. What a wonderful Christmas treat was dreading xmas and now have something to look forward too. What a delight. Saw it performed by the Komische Oper in East Berlin on 31 May 1961 - still have the programme; Hermin Esser as Rudolf, Elizabeth Ebert as Mimi. Real fireworks in the market scene and a live donkey. The Wall (initially wire) went up on 13 August that year, the cast dispersed. Tears as curtain fell then - and again this Christmas day. I did not like the production at all. The atic space was ridiculous as was the tiny stove; watch you don’t burn your hands on that pipe! I thought Act 3 was set at dawn not in the middle of the night and the final scene of Act 4 was a mess. No, it did nothing for me. Saw it on tv yesterday. This production is not realistic enough. The former one of John Copley war far better. F.Sempey and M.Kwiecien were excellent, N.Car not bad but not really moving and M.Fabiano not good enough, nevertheless the ROH production is much much better than the production we have this month in Paris, a dreadful and outrageous thing. About time too. These events should be on TV on a regular basis. The general population does'nt know what they are missing. Well done ROH and BBC. Lets have some more! We have belatedly watched this absolutely superb production and managed to get by on one man sized box of tissues, What is not to love about it. Brilliant and will be in the queue to buy tickets for the next performance. Thank you again ROH for a wonderful Christmas gift. I loved this production - cried buckets! Will it be available on DVD? ?